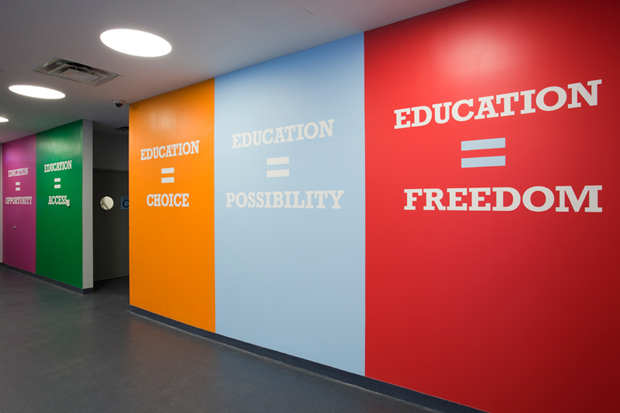 The Pentagram design firm recently tackled a Brooklyn public high school–and proved that turning a beige, hellish middle school into something inspiring is possible. The project was conducted in the Achievement First Endeavor Middle School, a charter school in Clinton Hill, Brooklyn. 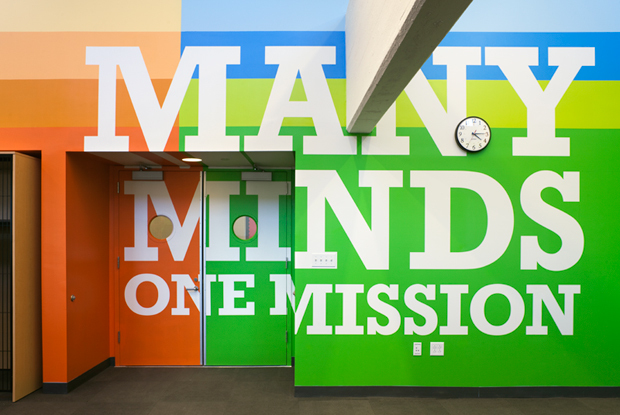 Paula Scher and the rest of the Pentagram team (one of our 10 Most Innovative Design Firms), already experienced with public places thanks to projects like these library murals, tackled the typically beige world of lockers, tile, and brick, and turned it into something bright and bold. 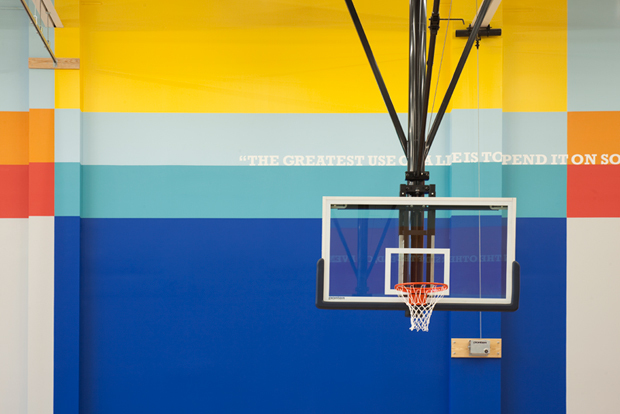 The transformation is actually relatively simple–no major construction was undertaken, and the project mostly consisted of big, vivid graphics all over the school, from the walls to the cafeteria, the gym to the stairwells. ultimately, they came to love it. And that fear of beige was a motivating factor from the start. Paula calls the Achievement First project “an opportunity to correct the beige mistake of my childhood,” as she “always thought that schools, libraries, medical clinics, and other public institutions I inhabited were mean.” Why did this dull and oppressive color scheme come to be the norm? “There is nothing more safe and boring than beige,” she says, but that’s precisely why she decided to go in the opposite direction for the project. It’s a really beautiful project, and completely changes the way a building that is often the site of an adolescent’s toughest years feels. This school feels open, cheerful, rife with possibilities–it just shows what good design can accomplish. You can read more about Pentagram’s project here.